If you only expect anime music, look somewhere else. Judging from past Pioneer CDs that have been associated with anime series, I was a little excited over the release of a BOA album in the US. When I first listened to the CD I thought that BOA isn't really the kind of music I'm into, but upon a second listening the tracks began to grow on me. Undoubtedly people will by the Twilight compilation because they know BOA did the opening theme song Duvet for the TV series Serial Experiments Lain and not because of the strange cover featuring some ostriches with steam coming out of their heads. But, for those expecting nothing but Japanese lyrics, you need to get a clue because this CD is totally in English–like you didn't already know that BOA does their music in English. One cool thing is all the song lyrics are included with the CD so you can follow along with the tracks if you so choose. The long version of the theme from Lain. You know the song. Twilight is a very unique song. It starts out slow and monotonous with a rhyme scheme that fits the steady beat and then goes into a more harsher version with louder and more frantic instrument usage before returning to normal for another cycle. What's interesting is the song is quite interesting to listen to just to experience the change in moods that the song brings about. This track seems to feed off of the frantic nature of the previous track and make things seem grim and bizarre. It's a hard track to describe due to the singing that is accompanied with almost chant like vocals. Rain is like a breath of fresh air in both style and mood. It's still mellow but the tone the background instruments bring makes it more cheery, but the grim lyrics bring that right back down. Talk about going mellow... this sounds like a slow version of Duvet. This song really has nothing to do with elephants. But, it's a decent break point after the past tracks. Finally a more upbeat song about how they will never be beaten or something like that. One thing about BOA is you have to listen to the music and figure out what they really mean, because their lyrics hold one meaning and the tone tells another story entirely. At first this song made me think it was going to be something heavy metal oriented, but the lyrics make it sound strangely country based in a way. It's got all the trademark high notes positioned throughout the song and it gives it a definite alternative flair. This song is the shortest one on the CD and the only one not sung by Jasmine Rodgers. In a way the song sounds like something Sting would release due to the ‘new day' nature of the song. Yet, on a positive note, the track has the most positive tone thus far. After the break of Steve Rodgers taking over lead vocals we are back to Jasmine. The track is a bit slower than the others and has a elevator mood to it with a touch of Dido's somber atmospheric sound quality that seems to steam from the fact it was dedicated to the memory of Dan Martin. Somber and then frantic. More of the same. Anna Maria is full of fast calypso ambiance with rhythmic vocals. Not really my cup of tea but it sounds good. Plus it's upbeat. Slow, rough, and undampered. These are the three qualities of the acoustic mix of Duvet. It's nice to hear what some of the more stressed words in the original version actually are. The acoustic version does have one problem–it's too slow at times. But, hearing all the instruments used more than makes up for this fact because this is such an emotion filled song. Geeze, this one is a lot to take in. It's even more harsh in both lyrical intent and in music variation than Twilight. It all wraps up with a slow song of vocals mixed with guitar strumming. A nice sense of peace is what this song brings to the end of the CD. If there was more heavy metal I could swear I was listening to the soundtrack to Book of Shadows: Blair Witch 2 or at least The X-Files CD, Songs in the Key of X. BOA's music is strangely haunting and gives you a sense of feeling down while trying to bring you out of the despair they have caused. 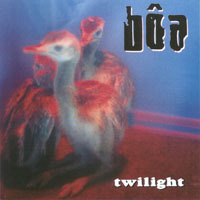 Twilight is a ensemble of various BOA hits and fan favorites, but it's truly one of those CDs that you need to really listen to a few times to figure out what the group is really trying to tell the listener. The CD is an oddity, but definitely one for otaku to check out.